Porifera means "pore bearer" and is the scientific name for sponges. They are considered simple animals as they consist of many cell types with special functions and they lack tissues and organs. Their skeleton can be composed from two materials: spongin (a soft, flexible organic material - made of the protein collagen) and spicules (small rods of calcium carbonate or silica). Sponges are sessile animals, they live permanently affixed at the base and do not move around as adults. As a result, they are unable to move to escape predators, but discourage attack with strong chemicals and an exterior of bristly textures. They feed by pumping large quantities of water (hundreds of litres per day) through their bodies and filtering out tiny organisms and dead plant and animal particles as food. This passage of water also brings in oxygen and takes out carbon dioxide and wastes. Sponges exist in all different shapes, sizes and colours, and members of the same species can vary depending upon where they live. 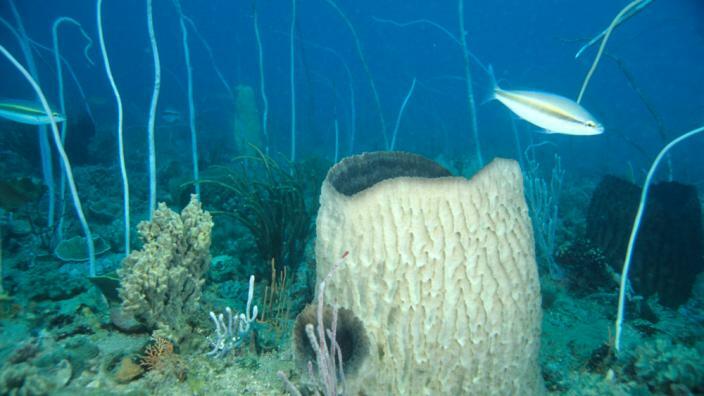 Sponges occur in marine and freshwater but do not occur on land. There are three classes of sponges existing now: Demospongiae, Calcarea and Hexactinellida (other classes have become extinct and are found in the fossil record).